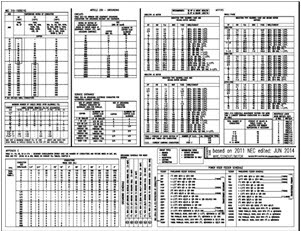 Today we are sharing with you 3 NEC Charts that James Boone from www.PowerSoftEng.com has graciously shared. He has been researching over the years and has put together cheat sheets for us all to use. "All of the things recorded in these charts are accumulated knowledge and research in many areas of personal interests and business. I hope you find the information helpful as I have." By James Boone, Electrical Designer. This chart is designed to allow designers or field technicians the ease of finding NEC charts without the need of a code book. 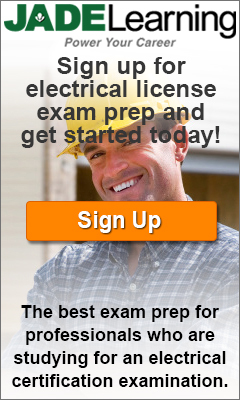 Readers should make their own determinations that the information contained herein is relevant to any specific situation where wiring is concerned. This chart incorporates most all instances of sizing wire ampacity, conduit fill, motor charts, grounding, power riser schedule and grounding schedule. The riser and grounding schedules show no particular code requirement, but a suggestion of naming wires for use in power risers, although there is no consideration for voltage drops. Make all adjustments as required. The motor charts were compiled from manufacturing agents for sizing motors that are within normal bounds of circuiting. 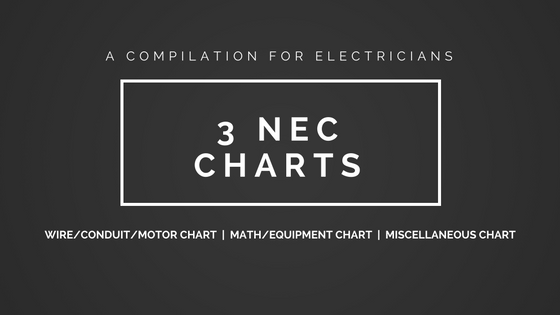 This chart has information regarding sections in the NEC, formulas, conduit table, power factor selections, some circuit design information, motor charts, working space and basic information for generators/elevators. This chart also includes a full service transformer information guide but depending on transformer specifics, can change, based on many design characteristics. Use this information only when using general specifics. This chart also shows general panelboard and transformer dimensions based on general information. Use sizes and information only as a general rule of thumb. Converting metric to English or visa-versa. Current carriers in conduit and what wires are required. Material resistivity and boiling points. Make sure to sign up for our newsletter to receive free information and sources like this. Posted in Resources and tagged 2014 nec code change, app for electricians, code book for electricians, code book index with page numbers, electrical business.